The African National Congress (ANC) controls the Ward, but is deeply split. ANC members vote against ANC members, complaining of a lack of accountability in the organisation. They claim that the people who represent the party and the local community in the Council do not represent the majority in the local party. This means the minority has the last say, with power and control over the masses through its positions. 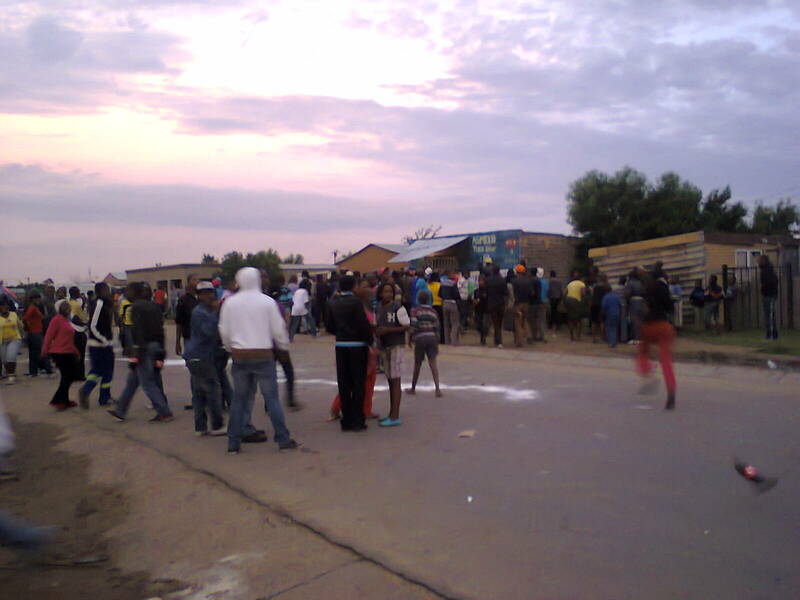 The local ANC is divided into two groups and the conflict spills over into the community. The problem did not start in 2016. An ANC faction approached the Sedibeng mayor of 2011-2015, Mr Simon Mofokeng, complaining a Ward councillor was employing his siblings and friends. The Mayor responded by dividing four projects in the affected Ward between the two factions. Mofokeng became Emfuleni Mayor later in 2015. In 2017, he was accused in the media of spending nearly R2 million on KFC and Nando’s fast food, and luxury hotels from 2011-2017. A public housing project was introduced by the provincial Department in February 2013. This involved a massive contract to the black capitalist firm Malgotamishe Building Construction. In August 2013, when the project started, the Department of Housing established a Project Steering Committee with different groupings, so the project could run smoothly and the information flow to all stakeholders. However, a section of the SA Communist Party (SACP) appeared on the scene, through the African National Congress (ANC)-led Alliance. The Alliance is made of the ANC, the SACP, and the Congress of SA Trade Unions (COSATU). It convinced the community that the project’s Community Liaison Officer (CLO) was only employing his friends, also pressuring desperate women in need of jobs into his bed. They called a community meeting to complain about the CLO, saying that they did not want the CLO because he was stubborn. They complained about the employment criteria he used, without consulting the community leaders or the Steering Committee. After the dismissal of the first CLO, the SACP group used the community to appoint its members the new CLO and the Local Development Officer (LDO). Then they forced new rules onto the Project Steering Committee, which resulted in the project stopping for nine months. Then the project started again, running smoothly for one year and six months, until violence and hate speech came back, dividing the community again. The fight is over the houses, the jobs and the positions. An SACP person involved in the fights said the old people in the area “must go back to the Eastern Cape” as they are “expired.” These are former migrant workers; going back means losing access to the new housing in Sebokeng. The problems led to block committees disbanding, although block committees are independent structures not affiliated with party structures. Major housing developments started taking place at Golden Gardens, close to the Golden Highway, around the Ward 17 area. The beneficiaries are mainly young people, who have access to the new subsidised “RDP” houses. Older people and workers are refusing to leave the old KwaMasiza Hostel, because it might be renovated and they want to benefit. The Ward councillor is using his followers to fight for control of key projects: rival groups have ended in hospital, beaten up by his group. Cheap politics destroys our communities. We need something better.